Anton Pavlovich Chekhov (Russian: Антон Павлович Чехов[note 1], tr. Antón Pávlovič Čéhov, IPA: [ɐnˈton ˈpavɫəvʲɪtɕ ˈtɕɛxəf]; 29 January 1860[note 2] – 15 July 1904[note 3]) was a Russian playwright and short-story writer, who is considered to be among the greatest writers of short fiction in history. His career as a playwright produced four classics, and his best short stories are held in high esteem by writers and critics. Along with Henrik Ibsen and August Strindberg, Chekhov is often referred to as one of the three seminal figures in the birth of early modernism in the theatre. Chekhov practiced as a medical doctor throughout most of his literary career: "Medicine is my lawful wife", he once said, "and literature is my mistress." Chekhov had at first written stories to earn money, but as his artistic ambition grew, he made formal innovations which have influenced the evolution of the modern short story. He made no apologies for the difficulties this posed to readers, insisting that the role of an artist was to ask questions, not to answer them. Anton Chekhov was born on the feast day of St. Anthony the Great (17 January Old Style) 29 January 1860 in Taganrog, a port on the Sea of Azov in southern Russia. He was the third of six surviving children. His father, Pavel Yegorovich Chekhov, the son of a former serf and his Ukrainian wife, was from the village Olhovatka [ru](Voronezh Governorate) and ran a grocery store. A director of the parish choir, devout Orthodox Christian, and physically abusive father, Pavel Chekhov has been seen by some historians as the model for his son's many portraits of hypocrisy. Chekhov's mother, Yevgeniya (Morozova), was an excellent storyteller who entertained the children with tales of her travels with her cloth-merchant father all over Russia. "Our talents we got from our father," Chekhov remembered, "but our soul from our mother." 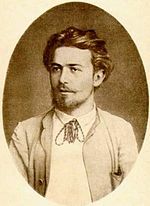 In adulthood, Chekhov criticised his brother Alexander's treatment of his wife and children by reminding him of Pavel's tyranny: "Let me ask you to recall that it was despotism and lying that ruined your mother's youth. Despotism and lying so mutilated our childhood that it's sickening and frightening to think about it. Remember the horror and disgust we felt in those times when Father threw a tantrum at dinner over too much salt in the soup and called Mother a fool." In 1876, Chekhov's father was declared bankrupt after overextending his finances building a new house, having been cheated by a contractor named Mironov. To avoid debtor's prison he fled to Moscow, where his two eldest sons, Alexander and Nikolay, were attending university. 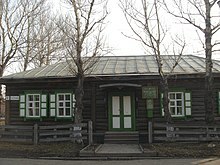 The family lived in poverty in Moscow; Chekhov's mother was physically and emotionally broken by the experience. 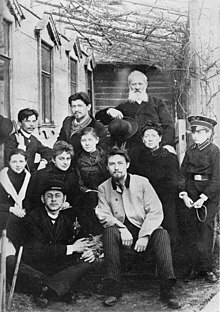 Chekhov was left behind to sell the family's possessions and finish his education. Chekhov remained in Taganrog for three more years, boarding with a man by the name of Selivanov who, like Lopakhin in The Cherry Orchard, had bailed out the family for the price of their house. Chekhov had to pay for his own education, which he managed by private tutoring, catching and selling goldfinches, and selling short sketches to the newspapers, among other jobs. He sent every ruble he could spare to his family in Moscow, along with humorous letters to cheer them up. During this time, he read widely and analytically, including the works of Cervantes, Turgenev, Goncharov, and Schopenhauer, and wrote a full-length comic drama, Fatherless, which his brother Alexander dismissed as "an inexcusable though innocent fabrication." Chekhov also experienced a series of love affairs, one with the wife of a teacher. Chekhov replied that the letter had struck him "like a thunderbolt" and confessed, "I have written my stories the way reporters write up their notes about fires – mechanically, half-consciously, caring nothing about either the reader or myself."" The admission may have done Chekhov a disservice, since early manuscripts reveal that he often wrote with extreme care, continually revising. Grigorovich's advice nevertheless inspired a more serious, artistic ambition in the twenty-six-year-old. In 1888, with a little string-pulling by Grigorovich, the short story collection At Dusk (V Sumerkakh) won Chekhov the coveted Pushkin Prize "for the best literary production distinguished by high artistic worth." 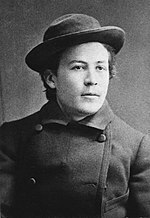 In autumn 1887, a theatre manager named Korsh commissioned Chekhov to write a play, the result being Ivanov, written in a fortnight and produced that November. Though Chekhov found the experience "sickening" and painted a comic portrait of the chaotic production in a letter to his brother Alexander, the play was a hit and was praised, to Chekhov's bemusement, as a work of originality. Although Chekhov did not fully realise it at the time, Chekhov's plays, such as The Seagull (written in 1895), Uncle Vanya (written in 1897), The Three Sisters (written in 1900), and The Cherry Orchard (written in 1903) served as a revolutionary backbone to what is common sense to the medium of acting to this day: an effort to recreate and express the "realism" of how people truly act and speak with each other and translating it to the stage to manifest the human condition as accurately as possible in hopes to make the audience reflect upon their own definition of what it means to be human. Chekhov later concluded that charity was not the answer, but that the government had a duty to finance humane treatment of the convicts. His findings were published in 1893 and 1894 as Ostrov Sakhalin (The Island of Sakhalin), a work of social science, not literature. Chekhov found literary expression for the "Hell of Sakhalin" in his long short story "The Murder," the last section of which is set on Sakhalin, where the murderer Yakov loads coal in the night while longing for home. Chekhov's writing on Sakhalin is the subject of brief comment and analysis in Haruki Murakami's novel 1Q84. It is also the subject of a poem by the Nobel Prize winner Seamus Heaney, "Chekhov on Sakhalin" (collected in the volume Station Island). Rebecca Ruth Gould has compared Chekhov's book on Sakhalin to Katherine Mansfield's Urewera Notebook (1907). 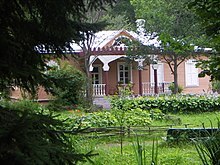 In 1892, Chekhov bought the small country estate of Melikhovo, about forty miles south of Moscow, where he lived with his family until 1899. "It's nice to be a lord," he joked to his friend Ivan Leontyev (who wrote humorous pieces under the pseudonym Shcheglov), but he took his responsibilities as a landlord seriously and soon made himself useful to the local peasants. As well as organising relief for victims of the famine and cholera outbreaks of 1892, he went on to build three schools, a fire station, and a clinic, and to donate his medical services to peasants for miles around, despite frequent recurrences of his tuberculosis. The first night of The Seagull, at the Alexandrinsky Theatre in St. Petersburg on 17 October 1896, was a fiasco, as the play was booed by the audience, stinging Chekhov into renouncing the theatre. But the play so impressed the theatre director Vladimir Nemirovich-Danchenko that he convinced his colleague Konstantin Stanislavski to direct a new production for the innovative Moscow Art Theatre in 1898. Stanislavski's attention to psychological realism and ensemble playing coaxed the buried subtleties from the text, and restored Chekhov's interest in playwriting. The Art Theatre commissioned more plays from Chekhov and the following year staged Uncle Vanya, which Chekhov had completed in 1896. In the last decades of his life he became an atheist. In March 1897, Chekhov suffered a major haemorrhage of the lungs while on a visit to Moscow. With great difficulty he was persuaded to enter a clinic, where the doctors diagnosed tuberculosis on the upper part of his lungs and ordered a change in his manner of life. In Yalta, Chekhov wrote one of his most famous stories, "The Lady with the Dog" (also translated from the Russian as "Lady with Lapdog"), which depicts what at first seems a casual liaison between a cynical married man and an unhappy married woman who meet while holidaying in Yalta. Neither expects anything lasting from the encounter. Unexpectedly though, they gradually fall deeply in love and end up risking scandal and the security of their family lives. The story masterfully captures their feelings for each other, the inner transformation undergone by the disillusioned male protagonist as a result of falling deeply in love, and their inability to resolve the matter by either letting go of their families or of each other. Chekhov's posthumous reputation greatly exceeded his expectations. The ovations for the play The Cherry Orchard in the year of his death served to demonstrate the Russian public's acclaim for the writer, which placed him second in literary celebrity only to Tolstoy, who outlived him by six years. Tolstoy was an early admirer of Chekhov's short stories and had a series that he deemed "first quality" and "second quality" bound into a book. In the first category were: Children, The Chorus Girl, A Play, Home, Misery, The Runaway, In Court, Vanka, Ladies, A Malefactor, The Boys, Darkness, Sleepy, The Helpmate, and The Darling"; in the second: A Transgression, Sorrow, The Witch, Verochka, In a Strange Land, The Cook's Wedding, A Tedious Business, An Upheaval, Oh! The Public!, The Mask, A Woman's Luck, Nerves, The Wedding, A Defenceless Creature, and Peasant Wives. In Chekhov's lifetime, British and Irish critics generally did not find his work pleasing; E. J. Dillon thought "the effect on the reader of Chekhov's tales was repulsion at the gallery of human waste represented by his fickle, spineless, drifting people" and R. E. C. Long said "Chekhov's characters were repugnant, and that Chekhov revelled in stripping the last rags of dignity from the human soul". After his death, Chekhov was reappraised. Constance Garnett's translations won him an English-language readership and the admiration of writers such as James Joyce, Virginia Woolf, and Katherine Mansfield, whose story "The Child Who Was Tired" is similar to Chekhov's "Sleepy". The Russian critic D. S. Mirsky, who lived in England, explained Chekhov's popularity in that country by his "unusually complete rejection of what we may call the heroic values." In Russia itself, Chekhov's drama fell out of fashion after the revolution, but it was later incorporated into the Soviet canon. The character of Lopakhin, for example, was reinvented as a hero of the new order, rising from a modest background so as eventually to possess the gentry's estates. Ernest Hemingway, another writer influenced by Chekhov, was more grudging: "Chekhov wrote about six good stories. But he was an amateur writer." And Vladimir Nabokov criticised Chekhov's "medley of dreadful prosaisms, ready-made epithets, repetitions." But he also declared “yet it is his works which I would take on a trip to another planet” and called "The Lady with the Dog" "one of the greatest stories ever written" in its depiction of a problematic relationship, and described Chekhov as writing "the way one person relates to another the most important things in his life, slowly and yet without a break, in a slightly subdued voice." While a Professor of Comparative Literature at Princeton University, Michael Goldman presented his view on defining the elusive quality of Chekhov's comedies stating: "Having learned that Chekhov is comic ... Chekhov is comic in a very special, paradoxical way. His plays depend, as comedy does, on the vitality of the actors to make pleasurable what would otherwise be painfully awkward – inappropriate speeches, missed connections, faux pas, stumbles, childishness – but as part of a deeper pathos; the stumbles are not pratfalls but an energized, graceful dissolution of purpose." 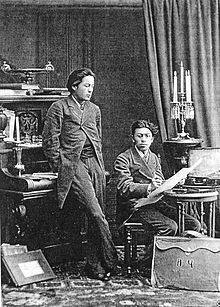 Chekhov has also influenced the work of Japanese playwrights including Shimizu Kunio, Yōji Sakate, and Ai Nagai. Critics have noted similarities in how Chekhov and Shimizu use a mixture of light humour as well as an intense depictions of longing. Sakate adapted several of Chekhov's plays and transformed them in the general style of nō. Nagai also adapted Chekhov's plays, including Three Sisters, and transformed his dramatic style into Nagai's style of satirical realism while emphasising the social issues depicted on the play. Chekhov's works have been adapted for the screen, including Sidney Lumet's Sea Gull and Louis Malle's Vanya on 42nd Street. Laurence Olivier's final effort as a film director was a 1970 adaption of Three Sisters in which he also played a supporting role. His work has also served as inspiration or been referenced in numerous films. In Andrei Tarkovsky's 1975 film The Mirror, characters discuss his short story "Ward No. 6". Woody Allen has been influenced by Chekhov and reference to his works are present in many of his films including Love and Death (1975), Interiors (1978) and Hannah and Her Sisters (1986). Plays by Chekhov are also referenced in François Truffaut's 1980 drama film The Last Metro, which is set in a theatre. The Cherry Orchard has a role in the comedy film Henry's Crime (2011). A portion of a stage production of Three Sisters appears in the 2014 drama film Still Alice. This page is based on the Wikipedia article Anton Chekhov; it is used under the Creative Commons Attribution-ShareAlike 3.0 Unported License (CC-BY-SA). You may redistribute it, verbatim or modified, providing that you comply with the terms of the CC-BY-SA.